Setting sights high on PCI compliance and cloud security. Laser eye surgery has seen a growing market during the last 15-20 years, but has been cost-prohibitive for a large portion of patients who could benefit from improved vision. Seeing a need, QualSight started in 2004 with the mission of finding a way to provide affordable LASIK vision correction surgery to patients. QualSight’s solution was a national network of independent ophthalmologists who perform LASIK from more than 800 locations and work with healthcare plan sponsors for access to quality care. QualSight has grown to represent more than 75 million members nationwide. Managing a massive network with sensitive patient information and electronic medical records (EMR), QualSight has always made it a priority to store data in the most secure way available. In 2010, QualSight was informed of an attempted hack against their infrastructure. Concerned about a repeat occurrence, QualSight made the proactive decision of stepping up their server security by sourcing reputable vendors. 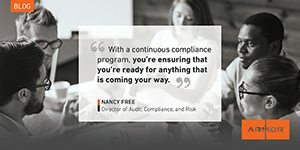 In QualSight’s search for a better secure cloud and online data storage, they’ve formed stringent requirements for HIPAA and PCI compliance. Few providers could meet any of the requirements set by QualSight and regulatory agencies. Then, QualSight discovered Armor through their HIPAA compliant reputation and formed a partnership to secure their patient data. Learn more about QualSight and their partnership with Armor by reading our, “Vision for Security” Case Study.